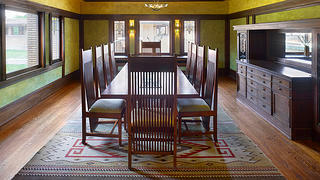 Frank Lloyd Wright was issued a test, of sorts, when a businessman named Darwin D. Martin approached him in 1902. Martin, an executive at the Larkin Soap Company in Buffalo, New York, was looking for an architect to design his company’s administration building. He had encountered Wright’s work during a trip to Chicago and was impressed by what he saw. But Wright worked primarily in the Midwest; his reputation had not yet reached the East Coast. So before commissioning Wright to take on the monumental task of designing his company’s building, Martin hired him to design a modest house for his sister, Delta, and her husband, George Barton. 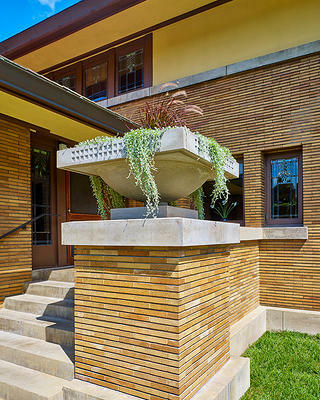 What resulted from Wright’s first East Coast commission was what many consider to be the finest example of his early Prairie-style work: a multi-building residential complex known as the Darwin D. Martin House. And this August, the Barton House—the very first building completed in the complex—re-opened, following a nearly year-long, $2 million restoration. 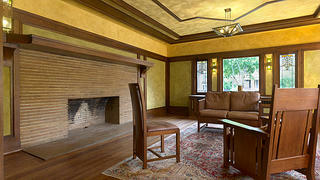 The Barton House's fireplace, woodwork, and plaster walls were all restored. The dining room at the Barton House. The Barton House has retained all of its original windows. 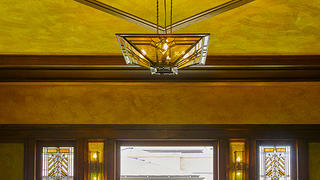 The original lighting fixtures of the Barton House were re-wired and repaired. The entrance to the Barton House. The four-bedroom Barton House, completed in 1903, helped catapult Wright into national prominence. 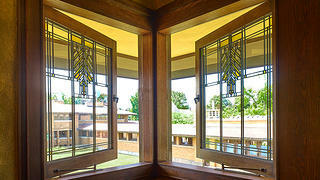 Martin was thrilled with Wright’s design, despite the fact that the architect nearly tripled the original budget for the house. “Martin saw something in Wright. He saw the genius in this young architect,” says Martin House executive director Mary Roberts. Indeed, Martin was so taken with the architect that he commissioned Wright to build his own home (known as the Martin House) on the same lot as the Barton House, as well as Graycliff, a summer house for his family in Derby, New York. Two other Larkin Company employees commissioned him to design their houses, as well. And yes, Martin did hire Wright to design the Larkin Administration Building—Wright’s first commercial commission. 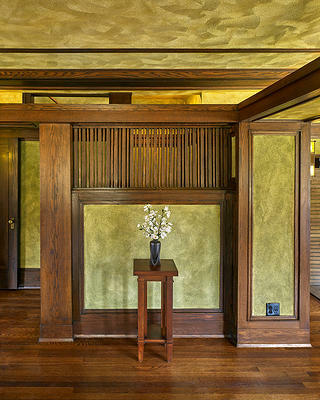 The Barton House was the first of six structures Frank Lloyd Wright designed for the Darwin D. Martin House complex. Throughout the years, though, the complex’s buildings had begun to fade. Later residents of the Martin House had made non-historic renovations to it, and it eventually sat vacant for many years. Three of the complex’s original structures were demolished, as well. In 1992, the Martin House Restoration Corporation (MHRC) was formed to raise money and oversee the complete restoration of the Martin House and, eventually, the entire complex. The Barton House was one of the final pieces of the complex’s restoration. It had fared better than the other buildings on the property, as it had been nearly continuously occupied since 1903, but it had some deferred maintenance. The house had retained all of its original materials, though, and had never seen any significant alterations throughout its life. “It was remarkably intact,” Roberts says. Work on the house began in September of 2017. Buffalo-based HHL Architects conducted extensive research and produced plans for the restoration. The house received major mechanical upgrades, including updated HVAC and electrical systems. The stucco eaves were replaced, and the masonry and chimney were repaired. 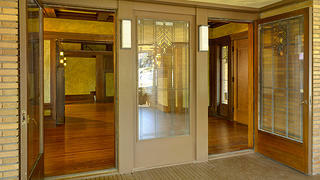 All of the interior woodwork and built-in cabinetry was refinished. The original lighting was re-wired and repaired. Much of the original plaster was repaired and replaced, and the original color washes were reinstated, using what Roberts calls time-tested, organic methods, led by artist Jo Hormuth. 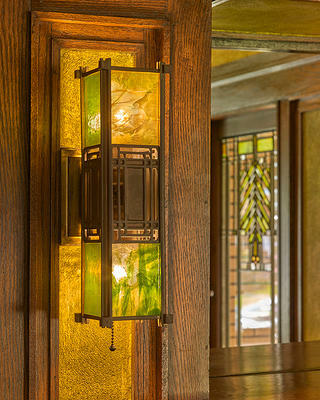 An original art glass wall sconce at the Barton House. 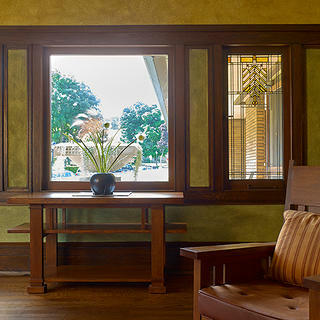 The plaster walls of the Barton House were restored to Wright's original specifications. Today, visitors can take guided tours of the entire estate, which is located in Buffalo’s historic Frederick Law Olmsted-designed Parkside neighborhood. And the Barton House is available for private events, as well. Next on the MHRC’s agenda is restoring the complex’s landscaping. Work began this past spring and is expected to be completed next year. It’s the final piece of the complex’s complete, decades-long restoration.